There is a Power in you that can Overcome Every Obstacle! Click below to hear Dr. Linda’s recent on line radio interview with Host, Steve Jorgensen ~ of the Indie Publishers Show! 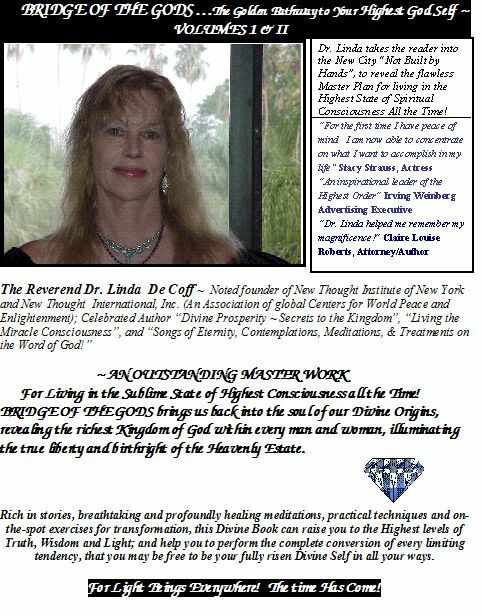 Dr. Linda speaks on “Bridge of the Gods”, and how this exquisite soul Bridge to the limitless and the eternal is created within you, and becomes your Source of Every Good. As you consciously ascend in awareness to realize ever more greatly your indestructable unity with your Divine and Immortal Self…Perfect, Whole & Complete on every level…You will find that no experience has ever changed who you really are in God, and that nothing is impossible to you! BRIDGE OF THE GODS ~ The Golden Pathway to your Highest God Self! There is no problem that cannot be overcome, by the Greater Power in you! *Please join us on our blog pages. Current topics of discussion ~ The Power of Choice! There is a Power in you that can Overcome Every Obstacle! Celebrating the Unlimited Divine Self within! Your comments or questions on any of our blog pages are most welcome!